// how did the title ‘lying still’ come about? // that emerged at the very beginning. it was around the time i took the third image. all of this stuff was happening to my body and i was feeling trapped in my apartment and i couldn’t do anything after having various surgeries. i started taking the pictures as a way of processing things. ‘lying still’ was describing that feeling when something is happening to you and you just have to brace yourself and wait for it to blow over, or even the sensation of being stunned like a deer in the headlights. // you like to combine found images with your own work, where do you source them? // i found all of the black and white images from ‘lying still’ on ebay. using the found images became another way to express the topics that are important to me: the female body, female representation and how we deal with our subconscious minds. // were you intentionally looking for a certain type of image to compliment your photographs? // i had been working on ‘lying still’ for a number of years-focusing on the self-portraits and still lifes – and i had come to a point where i had developed a substantial body of work but i felt like something was missing. i felt i should step away from it and let it simmer. then i started to work on the ‘mimesis’ project. i began to feel that both projects over lapped to an extent, in the way that they both were similar in their need to go deeper and try to express something that is hard to put into words. so i tried to combine the two projects, which didn’t really work. so it was then i thought of adding specific found images with ‘lying still’. i began searching for images that would be the extension of my photographs. // the found images also had some humor, which help punctuate the weightiness of your own images, was this intentional? // yes, that was important. ‘lying still’ started out as a very personal body of work, but although it’s a personal body of work, it isn’t all about me. including the found images helped to open it up and make it a broader statement that more people could identify with. // it appears to be your most personal body of work to date. do you think that reflects your age in the sense that you are getting closer to your inner self and you’re less self-conscious as you are when you are younger? // yes, that really resonates with me. when i worked on projects before i took a lot of portraits and realized that you were entering this very personal space with others, however when you are taking pictures of other people there is a tendency to interpret what you see in this person, but how much can you actually say about a person in a picture? i began to wonder how much my subjects were basically stand-ins for the way i was feeling. although i don’t give a lot of directions when photographing, they are still my cast that i have chosen and i had a very particular vision in mind when creating ‘the idea of north’, for example. i then got to a point where i was getting frustrated; there are certain boundaries when photographing a stranger. so this need to go beyond the typical posing and my personal journey i was going through led me to begin taking pictures of myself, which felt as if i was embracing a kind of strength and sensitivity in myself that i once saw as a weakness. // sometimes the darkest periods can be the most creative of times, do you agree? // yes i agree; dark moments can bring out good work and the emotions that seem to fuel creativity. sometimes we produce our best work when we are in the darkest place. // in this issue of blow, we explore the theme of self-portraiture and somehow we have been drawn to the work of more female photographers than male. do you see any differences between male and female self-portraiture? // i’ve noticed that women’s work can sometimes deal with far more personal topics. there are many male writers and artists who do put themselves out there, but there aren’t as many male photographers who turn the camera towards themselves in a way that makes them selves vulnerable. in order to be really passionate about something it has to be close. when you feel really strongly about your work and it’s so personal it develops a certain kind of strength. maybe just being a woman and having this desire to feel it out and express it and share it, we see photography as just another tool to express it. that’s how i use photography. // all of the pictures in this body of work are taken inside, in your apartment. was that an intentional effort to capture how you were feeling trapped inside your own body? // i was trying to capture myself sitting with all these emotions and being restricted by my body when it is ill. i wasn’t under house arrest, but i was spending a lot of time inside. i couldn’t travel much. it was like a journey inwards; an internal landscape. i was trying to express certain things in a space i felt comfortable in, which tends to be your own home. at the beginning i tried to incorporate some outdoor shots but it just didn’t feel right. // some of the imagery you have used is quite symbolic and poetic // yes the most important part of this work was to be subtle and to find the right balance between conveying an emotion without being too obvious. it was important to me to be poetic about it and to also express the beauty of these dark periods, that aren’t all negative. photography allows you to observe yourself and sit with all that is happening and learn to comfort yourself and find other people that can relate and connect with on this level. it was important for me not to have this screaming body of work about all this suffering i was going through. // was there ever a point where you thought, ‘i can’t share these pictures, they’re too personal’? // yes, i had to work on finding the right tone, like turning the volume up and down. in order to test this out, at certain moments i documented a lot of really powerful images, but it took me a while to figure out the right tone. there were some more visually explicit images of my fresh scars straight after surgery, at the time i was feeling a lot of anger and the tone was a lot louder. then later, i decided those pictures were for me and nobody else. // what are you working on at the moment? // i have been working for a long time on a long-term project with my family in germany. they are all portraits revolving around the people and things i grew up with. over time it has become quite a substantial project dealing with, amongst other things, my mother’s dementia, and my parents are moving out of the family home and it’s all about the house and their things. this was originally about my need to capture a moment; when you live abroad and visit home you notice the changes more. 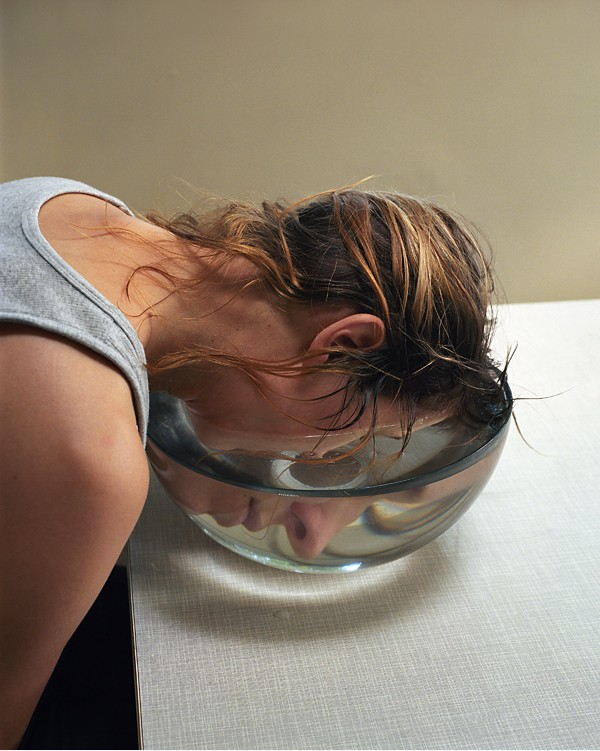 birthe piontek / born: 1976 / nationality: german / currently based: vancouver / ‘lying still’ uses the medium of self-portraiture to look inwards, observing oneself, examining notions of mortality, sexuality, intimacy roles and relationships and how they are constantly changing. captured in the familiar surroundings of a domestic space, the images take on a deeper psychological meaning by using rich iconography and symbolism to punctuate the daily routines. the inclusion of found images and still lifes point towards a collective experience. they expose the urges, fears and desires that exist in our sub-conscious and reveal themselves when we are at out most vulnerable, in our homes carrying on with our daily lives.